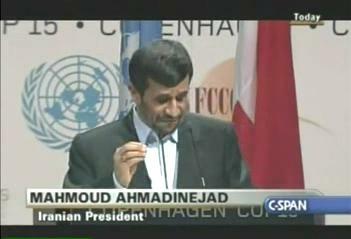 President Ahmadinejad Climate Change Summit Speech Copenhagen. Ayatollah Seyyed Ali Khamenei, Sayyed Ali Khamenei was born in Mashad, the holiest city, in the north-eastern province of Khorasan, in 1939. Both his parents belonged to clergy\'s families and spent the year 1964, he achieved the highest degrees in his theological studies at the Theological Academy of Qum but continued his studies at the Theological Academy at Mashad up to the age of twenty-nine. Political Activities before Victory of The Islamic Revolution During the rule of the deposed shah, Ay. Khamenei was a favourite pupil of Imam Khomeini, the leader of the Islamic Revolution, he was also considered to be one of the most eminent and dependable leaders of the movement of the Iranian Muslims, this movement entered a new phase in 1962 after Imam Khomini`s pronouncements against the Shah regime. Responsibilities After the Victory In the course of these struggles, Ay. Khamenei was arrested many times and spent three years in prison between 1964 and 1978. He was also exiled to a place with worst climate condition for almost a year. In 1978, upon return from exile and the height of the revolutionary of the Iranian Muslims, he, together with a few close associates led the struggle of the people in Khorasan. Later, in the same year when Leader of the Revolution was temporarily in Paris, he was selected as a member of the government of the Islamic Republic of IRAN. He was entrusted with the responsibility of representing the Revolutionary Council in the Army as well as Deputy for Revolutionary Affairs at the National Ministry of Defence and some time later. He was appointed to the post of the Revolutionary guards. At about this time, Imam Khomeini chose him to lead the Friday congregational Prayers in Tehran and in 1980 he was elected to Islamic Consultative Assembly by the people of Tehran. After the formation of the Supreme Council of Defence, Ay. Khamenei joined it as the representative of Imam Khomeini. Ay. Khamenei was one of the founding members of the Islamic Republic Party in IRAN and held the post of the Secretary-General of the Party. Ay. Khamenei was the victim of an assassination attempt on 27th June 1981. having delivered an important speech at the consultative assembly, which ended in the dismissal of Bani-Sader from the Presidency of IRAN, he was addressing the faithful at poor residential area in Tehran, after leading the congregational prayer, when a time-bomb exploded nearby which injured him in the hand, chest and face. He was immediately transferred to a hospital by the deboted people of Tehran and he miraculously survived; his right hand, however, is not still functioning properly. Presidency In the 1981, following the martyrdom of the second President of the Islamic republic of Iran, he becomes a candidate and, in September of the same year, he was elected the Third President of the Islamic Republic of Iran with %95 of the votes cast in his favour by the Iranian people (the total number of votes was 16,847,717). He was reelected as president in 1985 for a second four-year term. Ay. Khamenei heads the Supreme Council of Defence and the Supreme Council of the Cultural Revolution. Since the beginning of the imposed war, he has often visited various war fronts and has often inspected the frontline in order to help remove any shortcoming or to advise on organizational matters. Leadership In 4th June 1989, One day after demise of Imam Khomeimi, Assembly of Experts closed Ayatollah Khamenei to lead the Islamic Revolution of IRAN.Since 1994, Ayatollah Khamenei has been introduced as the Religious authority in religious authority for Shi`ait people in the world by the Ulama from different countries. Family Mr. Khamenei is married and has six children. Works & Books He has a good command of the Arabic and Turkish and English language and, in addition to writing, he is a good judge of literary and poetic works. He has translated and written numerous books on Islam and history. His translations include \" Future of the Islamic lands,\" \" A Thdictment against the Western Civilization,\" and \" Imam Hassan`s Peace Treaty.\" From among his writings, one may mention: \" The Role of Muslims in the Independence struggle of India.\" General Pattern of Islamic Thought in the Quran,\" The Question of Patience,\" On the Inner Depth of prayers,\" \"Understanding Islam properly,\" \"Imam Al-Sadegh`s Life,\" and a collection of lectures on the question of Imamate. He was also a co-writer of the famous pamphlet \" Our Positions,\" which helped the political, social and philosophical advancement of Islamic Republic Party. Other contributors were martyred Ayatollah Beheshti, martyred Hojjatol-Eslam Bahonar and Hojjatol-Eslam Hashemi Rafsanjani. Документальный фильм Галины Царёвой - ХААРП Климатическое оружие массовой поражении - часть первая. Following Tunisia's revolution, winds of change swept across Egypt and led to the fall of Hosni Mubarak. But here, in the somewhat cooler climate of London England, Egyptian democracy campaigners say it's still business as usual. At a meeting across the street from parliament, a gathering of Egyptian campaigners gave a clear warning to the British establishment that the era of western backed dictatorships in the region was coming to an end. The Egyptian democracy campaigners want a real change in the direction of Britain's foreign policy, and they say the UK government can start by freezing the assets of the Mubarak family in Britain The assets, say the campaigners, are the proceeds of corruption, and must be repatriated to the Egyptian people. Video Tags: Egypt egyptian revolution uprising demo rally protest support london uk england britain assets freeze demand corruption president resignation Hosni Mubarak. Professor Noam Chomsky talks about US Imperialism, Unions protests in Wisconsin and uprisings in the middle east. The holy month's beginning is based on sighting of the moon which is usually confirmed by religious authorities. However in multicultural Ukraine, some Muslim communities go ahead with the date announced by their countries of origin and others follow the date of their country of residence. The holy days of Ramadan begin and end with the prayers. The evening prayer is followed by the fastbreaking iftar. In Ukraine Iftar menu is as multicultural as Ukrainian Muslims are. Fasting is intended to remind Muslims of self-discipline and self-restraint. During Ramadan, Muslims avoid from eating, drinking and smoking during the daylight. They have food twice a day, one before sun rises and the other after the sun set. Fasting in Ukraine has its own features, says this mufti. For instance the daylight length in the country may climb to 18 hours. Ukrainian Muslims also point to the high humidity of the climate which makes people feel the heat. However most Muslims in Ukraine don't see any problem in this This year Ukrainian Muslim communities invited muftis from Saudi Arabia and Egypt to perform readings during Ramadan. The holy month will be also marked by charities and sharing food with the needy.